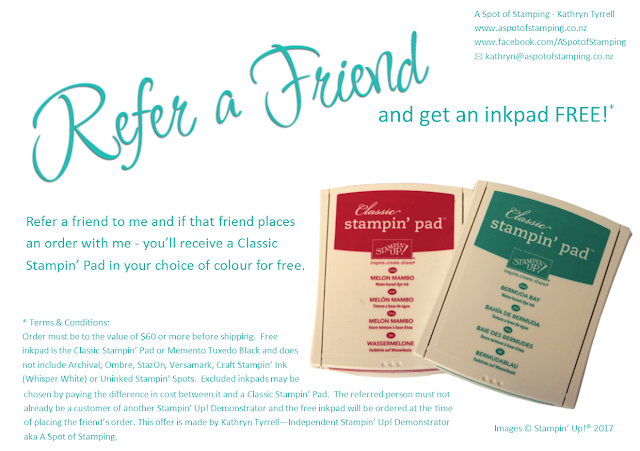 Refer a friend, or friends, to me and if that friend places an order with me over $60 before shipping, you'll get an inkpad in the colour of your choice for free. Order must be to the value of $60 or more before shipping. Free inkpad is the Classic Stampin' Pad or Memento Tuxedo Black and does not include Archival, Ombre, StazOn, Versamark, Craft Stampin' Ink (Whisper White) or Uninked Stampin' Spots. Excluded inkpads may be chosen by paying the difference in cost between it and a Classic Stampin' Pad. The referred person must not already be a customer of another Stampin' Up! 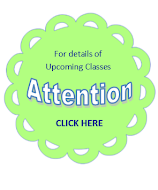 Demonstrator and the free inkpad will be ordered at the time of placing the friend's order. This offer is made by Kathryn Tyrrell - Independent Stampin' Up! Demonstrator aka A Spot of Stamping.